Going into Soulpepper’s production of Glenn, Canadian playwright David Young’s kaleidoscopic biography of Glenn Gould, I was only familiar with the footnotes of Gould’s life and career. I knew that he was from Toronto (my friend lives in the building on St. Clair Avenue where Gould used to live, there’s a plaque outside stating as much), and that he was a fairly renowned classical pianist. But other than that I knew very little of the complex and controversial character that Gould was. Gould is undoubtedly a fascinating figure: a pianist, composer and broadcaster; a prodigious performer who eschewed the stage, a hypochondriac, a contrarian who experimented with technology and a provocateur who enjoyed challenging the classical music establishment. Gould was particularly renowned for his interpretations of Bach. He recorded Bach’s Goldberg Variations twice in his career, in 1955, at the beginning of his career as a recording artist and again in 1981, months before his death. These two recordings also bookend the play. 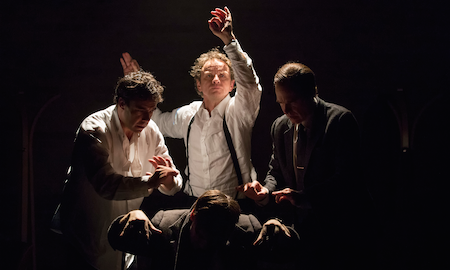 In Glenn, playwright David Young presents us with four variations of Gould’s persona embodied by four actors; The Prodigy (Jeff Lillico), The Performer (Mike Ross), The Perfectionist (Steven Sutcliffe), and The Puritan (Brent Carver). The play is essentially a non-linear biography that riffs on different aspects of Gould’s character and takes us deep into his psyche. The four Goulds interact with each other, challenge one another and assume alter egos. The densely-layered, often overlapping dialogue is almost schizophrenic at times. It’s a challenging piece that’s definitely abstract but at times I thought it was downright obtuse. I found the show very difficult to engage in and after a while the schtick wore thin and I found myself having to really work to focus on the show. For such an abstract, non-linear piece to work I think it pretty much has to take a balls-to-the-wall approach and just go for broke even if it risks taking it over top. There are parts of the second act where the show comes close but overall I found director Diana Leblanc’s approach to the piece a little too timid, the pacing slow and the overall energy-level of the performance too low to make the piece really pop. Glenn is also a unique ensemble piece in that all four actors play variations of the same character, however, other than the fact that one is a bit younger and one a bit older, I found the distinction between the four personas muddled. The performances lacked clarity and felt tentative and rarely did the individual performances coalesce to become more than the sum of their parts. I’d be curious to hear what Gould scholars, his fans or those who knew him in real life would think of this abstract portrait. Coming from the point of view of someone with no particular vested interest in Glenn Gould I found the play pretty inaccessible. Leaving Glenn I’m not sure I have any better understanding of the man or his motivations than when I went in. Glenn is playing through October 1, 2014 at the Young Centre for the Arts, 50 Tank House Lane, in the Distillery Historic District, Toronto. Tickets are available in person at the venue box office, by phone at 416-866-8666 or online at soulpepper.ca. Photo of Mike Ross, Brent Carver, Jeff Lillico & Steven Sutcliffe by Cylla von Tiedemann.